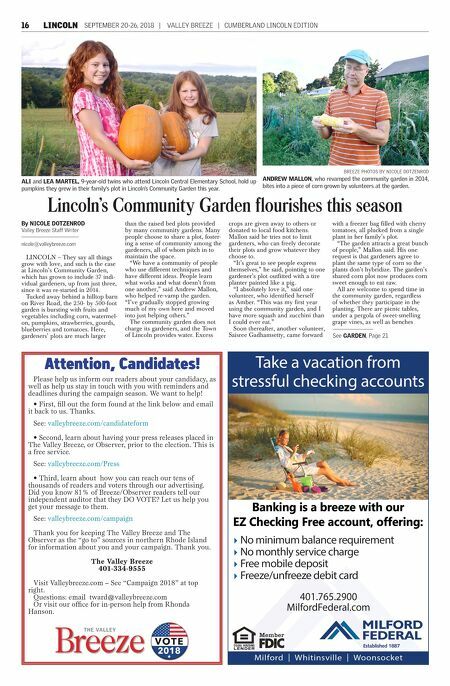 CUMBERLAND LINCOLN EDITION | VALLEY BREEZE | SEPTEMBER 20-26, 2018 17 2920 Diamond Hill Road, Rte. 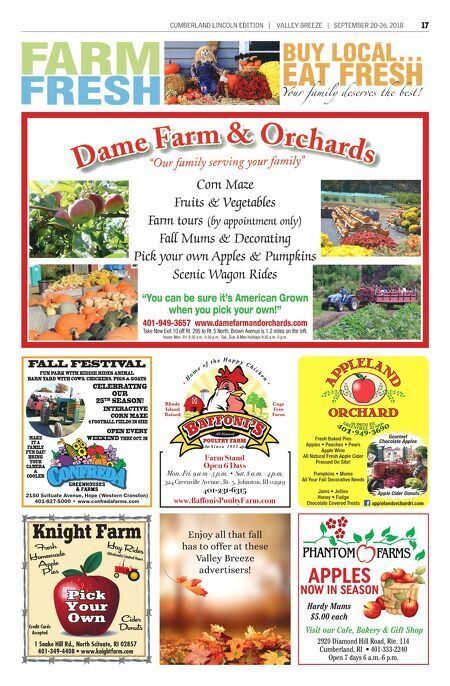 114 Cumberland, RI • 401-333-2240 Open 7 days 6 a.m.-6 p.m. APPLES NOW IN SEASON Visit our Cafe, Bakery & Gift Shop Hardy Mums $5.00 each Knight Farm Cider Donuts Hay R ides (Weekends) Limited Hours Fresh Homemade Apple P ies 1 Snake Hill Rd., North Scituate, RI 02857 401-349-4408 • www.knightfarm.com Pick Your Own Credit Cards Accepted Your family deserves the best! Fresh Baked Pies Apples • Peaches • Pears Apple Wine All Natural Fresh Apple Cider Pressed On Site! Pumpkins • Mums All Your Fall Decorative Needs Jams • Jellies Honey • Fudge Chocolate Covered Treats applelandorchardri.com Gourmet Chocolate Apples Apple Cider Donuts ORCHARD ORCHARD ORCHARD ORCHARD ORCHARD ORCHARD ORCHARD ORCHARD ORCHARD ORCHARD ORCHARD ORCHARD ORCHARD ORCHARD ORCHARD ORCHARD ORCHARD ORCHARD ORCHARD 401-949-3657 www.damefarmandorchards.com Take New Exit 10 off Rt. 295 to Rt. 5 North. Brown Avenue is 1.2 miles on the left. Hours: Mon.-Fri. 8:30 a.m.-5:30 p.m.; Sat., Sun, & Mon Holidays 9:30 a.m.-5 p.m. "You can be sure it's American Grown when you pick your own!" Corn Maze Fruits & Vegetables Farm tours (by appointment only) Fall Mums & Decorating Pick your own Apples & Pumpkins Scenic Wagon Rides 2150 Scituate Avenue, Hope (Western Cranston) 401-827-5000 • www.confredafarms.com CELEBRATING OUR 25 TH SEASON! FALL FESTIVAL FUN PARK WITH KIDDIE RIDES ANIMAL BARN YARD WITH COWS, CHICKENS, PIGS & GOATS INTERACTIVE CORN MAZE 4 FOOTBALL FIELDS IN SIZE OPEN EVERY WEEKEND THRU OCT. 28 MAKE IT A FAMILY FUN DAY! BRING YOUR CAMERA & COOLER Farm Stand Open 6 Days Mon.-Fri. 9 a.m - 5 p.m. • Sat. 8 a.m. - 4 p.m. 324 Greenville Avenue, Rt. 5, Johnston, RI 02919 401-231-6315 www.BaffonisPoultyFarm.com Enjoy all that fall has to offer at these Valley Breeze advertisers!